This week has been a challenge for me, and based on what my internet friends have been sharing, it seems that I'm not the only one feeling this way. But here's the thing that I think we forget these days - you can't be "on" every damn day. It's just not possible. Some days you have an off week. Some week's you have an off week. That's just how it goes. This is hard to remember because in the age of social media we are constantly being bombarded with curated content. The best of the best from people who appear to have it all together all the time. But I can almost guarantee you that even the people who are being really real on social media, still aren't sharing all the things that they struggle with. Someone who I really love and respect on social media shared that people constantly assume that she's always happy and that her life is perfect, because that's what she shares. But she said that she's not going to share her "family's dirty laundry" online because that's not fair to represent them in that way and she chooses to present them in the best light. But that doesn't mean that she and her husband don't argue or that her baby doesn't cry or that she never feels stressed out, sad, or angry. She also said that she doesn't share her problems until she has a solution because people assume that when she shares a problem without a solution that she is seeking advice or help, which is not always the case. 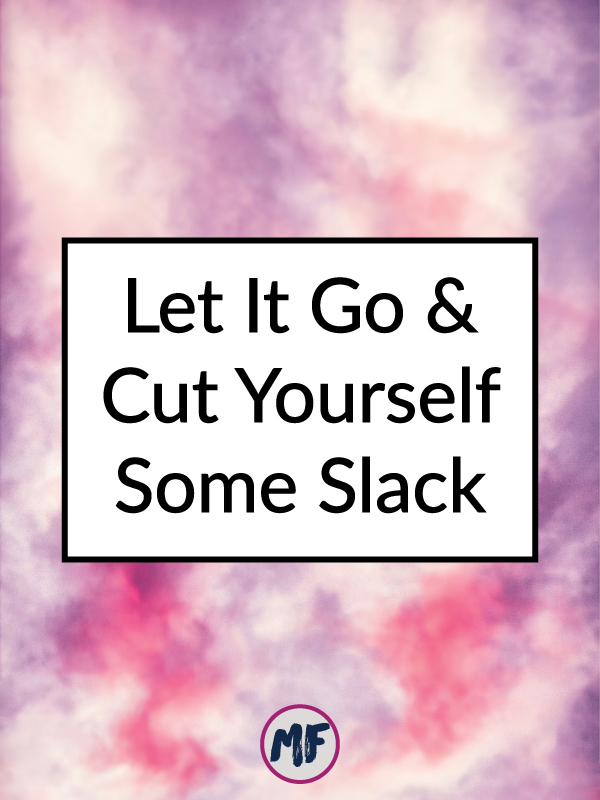 So, rather than beating ourselves up when we get less than 30% of the things done on our lists for the week (that's a failing grade no matter how you cut it...UNLESS the rest of you also didn't accomplish much and we can grade on a massive curve), let's cut ourselves (and each other) some slack. Lean into the lack of productivity and use it as some down time or time to reflect on things. Use it as time to do things that make you happy not things you feel like you should be doing or need to get done. So when things don't go your way for a day or a week, take a new approach. Stop comparing yourself to others, because that's not going to make anything better. Turn off your phone and back away from your computer. Stay off social media as much as possible. Lower your expectations (it's ok, trust me, this is just temporary) and rather than trying to get 50 things done, feel accomplished that you got out of bed and fed yourself for a day (I'm serious here). Put yourself first and do something nice for you. A bath, a massage, a coffee date, even that checkup at the doctor you've been putting off...because that counts as self-care too. Realize that everything will still be ok if you don't do it all. So you forgot your BFFs birthday, it happens. Apologize, send them a nice note, and move on! And finally, focus on your feelings not your tasks. Start a gratitude list, write in your journal, or do something that makes you feel happy. Sometimes a little shift in perspective is all you need to snap out of a funk. I know I'm not the only one who is feeling this way this week. I've seen more photos of things exploding out of blenders, spilled coffee/matcha, allergic reactions, mystery illnesses, and battles with internet trolls this week that I think I've ever seen before. But don't worry, tomorrow is a new day and next week is a new week! What's your favorite way to combat a funk?